The Flair Puck is a wireless1 smart thermostat for Mini Splits, Window ACs, Portables, and more. Easy to use, easy to control, and saves you energy. Even your space heater or fan! 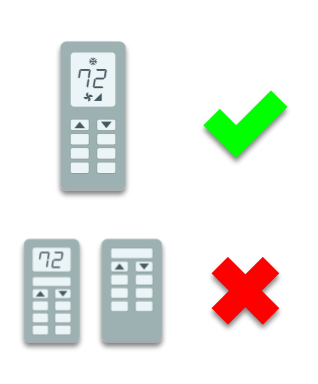 Have a Mini Split system (wall-mounted air conditioner) or a Window AC and want to control it over WiFi? Puck is the only smart, wireless1, and affordable option that works with these systems. Ditch your old-school remote. Our sophisticated cloud-based automation can save you up to 30% on your energy bills. With preheating and precooling, Puck will automatically make sure your room is the perfect temperature when you get home. Never come home to an uncomfortable home ever again. Already have a Nest or ecobee thermostat? Want it to control your Mini Split or Window AC? No problem. What other thermostat can do that? Make your smart home brilliant. AC Power or AAA batteries? You choose. Your first Puck plugs in to AC power. The rest can be completely wireless. Set the temperature on our iOS, Android, or web app and never worry about adjusting your thermostat ever again. Want more? The app also keeps track of temperature, pressure, humidity, and ambient light in each room that has a Puck. The Flair Puck features in-room temperature control. With our simple, responsive, and intuitive design, you can set temperatures on the Puck itself, rather than having to use your smartphone. That means you can put a Puck in your guest room, AirBnB, or rental property. 1.Flair Pucks are wireless after the first Puck. One Puck must always be plugged in.